This article is about the country. For other uses, see Laos (disambiguation). Laos (/ˈlɑːoʊs/ ( listen), /laʊs, ˈlɑːɒs, ˈleɪɒs/; Lao: ລາວ, Lāo [láːw]), officially the Lao People's Democratic Republic (Lao: ສາທາລະນະລັດ ປະຊາທິປະໄຕ ປະຊາຊົນລາວ, translit. Sathalanalat Paxathipatai Paxaxon Lao; French: République démocratique populaire Lao), commonly referred to by its colloquial name of Muang Lao (Lao: ເມືອງລາວ, Muang Lao), is a socialist state and the only landlocked country in Southeast Asia. Located at the heart of the Indochinese peninsula, Laos is bordered by Myanmar (Burma) and China to the northwest, Vietnam to the east, Cambodia to the southwest, and Thailand to the west and southwest. Including over 100 smaller ethnic groups. Present-day Laos traces its historic and cultural identity to the kingdom of Lan Xang Hom Khao (Kingdom of a Million Elephants Under the White Parasol), which existed for four centuries as one of the largest kingdoms in Southeast Asia. Due to Lan Xang's central geographical location in Southeast Asia, the kingdom became a popular hub for overland trade, becoming wealthy economically as well as culturally. After a period of internal conflict, Lan Xang broke off into three separate kingdoms—Luang Phrabang, Vientiane and Champasak. In 1893, it became a French protectorate, with the three territories uniting to form what is now known as the country of Laos. It briefly gained independence in 1945 after Japanese occupation, but was recolonised by France until it won autonomy in 1949. Laos became independent in 1953, with a constitutional monarchy under Sisavang Vong. Shortly after independence, a long civil war began, which saw the communist resistance, supported by the Soviet Union, fight against, first, the monarchy and then a number of military dictatorships, supported by the United States. After the Vietnam War ended in 1975, the Communist Pathet Lao movement came to power, seeing the end to the civil war. 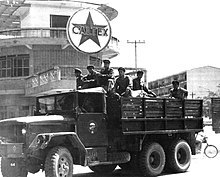 During the first years of Communist rule, Laos was dependent on military and economic aid supported by the Soviet Union until its dissolution in 1991. In 2018, the country had the fourth highest GDP (PPP) per capita in Southeast Asia, after Singapore, Malaysia and Thailand. In the same year, the country ranked 139th on the Human Development Index (HDI), indicating medium development. Laos is a member of the Asia-Pacific Trade Agreement (APTA), Association of Southeast Asian Nations (ASEAN), East Asia Summit and La Francophonie. Laos applied for membership of the World Trade Organization (WTO) in 1997; on 2 February 2013, it was granted full membership. It is a one-party socialist republic espousing Marxism–Leninism governed by the Lao People's Revolutionary Party. The capital and largest city is Vientiane. Other major cities include Luang Prabang, Savannakhet and Pakse. The official language is Lao. Laos is a multi-ethnic country, with the politically and culturally dominant Lao people making up about 55 percent of the population, mostly in the lowlands. Mon-Khmer groups, the Hmong and other indigenous hill tribes, accounting for 45 percent of the population, live in the foothills and mountains. Laos's strategies for development are based on generating electricity from its rivers and selling the power to its neighbours, namely Thailand, China and Vietnam, as well as its initiative to become a "land-linked" nation, shown by the construction of four new railways connecting Laos to its neighbours. Laos has been referred to as one of East Asia and Pacific's Fastest Growing Economies by the World Bank, with annual GDP growth averaging 7.8% for the past decade. The English word Laos was coined by the French, who united the three Lao kingdoms in French Indochina in 1893 and named the country as the plural of the dominant and most common ethnic group, which are the Lao people. In the Lao language, the country's name is "Muang Lao" (ເມືອງລາວ) or "Pathet Lao" (ປະເທດລາວ), both literally mean "Lao Country". Pha That Luang in Vientiane is the national symbol of Laos. An ancient human skull was recovered from the Tam Pa Ling Cave in the Annamite Mountains in northern Laos; the skull is at least 46,000 years old, making it the oldest modern human fossil found to date in Southeast Asia. Stone artifacts including Hoabinhian types have been found at sites dating to the Late Pleistocene in northern Laos. Archaeological evidence suggests agriculturist society developed during the 4th millennium BC. Burial jars and other kinds of sepulchers suggest a complex society in which bronze objects appeared around 1500 BC, and iron tools were known from 700 BC. The proto-historic period is characterised by contact with Chinese and Indian civilisations. According to linguistic and other historical evidence, Tai-speaking tribes migrated southwestward to the modern territories of Laos and Thailand from Guangxi sometime between the 8th–10th centuries. Laos traces its history to the kingdom of Lan Xang (Million Elephants), which was founded in the 14th century by a Lao prince Fa Ngum,:223 who, with 10,000 Khmer troops, took over Vientiane. Ngum was descended from a long line of Lao kings that traced back to Khoun Boulom. He made Theravada Buddhism the state religion and Lan Xang prospered. Within 20 years of its formation, the kingdom expanded eastward to Champa and along the Annamite mountains in Vietnam. His ministers, unable to tolerate his ruthlessness, forced him into exile to the present-day Thai province of Nan in 1373, where he died. Fa Ngum's eldest son, Oun Heuan, ascended to the throne under the name Samsenthai and reigned for 43 years. Lan Xang became an important trade centre during Samsenthai's reign, but after his death in 1421 it collapsed into warring factions for 100 years. In 1520, Photisarath came to the throne and moved the capital from Luang Prabang to Vientiane to avoid a Burmese invasion. Setthathirat became king in 1548, after his father was killed, and ordered the construction of what became the symbol of Laos, That Luang. Setthathirat disappeared in the mountains on his way back from a military expedition into Cambodia and Lan Xang began to rapidly decline. It was not until 1637, when Sourigna Vongsa ascended the throne, that Lan Xang further expanded its frontiers. His reign is often regarded as Laos's golden age. When he died without an heir, the kingdom split into three principalities. Between 1763 and 1769, Burmese armies overran northern Laos and annexed Luang Phrabang, while Champasak eventually came under Siamese suzerainty. Chao Anouvong was installed as a vassal king of Vientiane by the Siamese. He encouraged a renaissance of Lao fine arts and literature and improved relations with Luang Phrabang. Under Vietnamese pressure, he rebelled against the Siamese in 1826. The rebellion failed and Vientiane was ransacked. Anouvong was taken to Bangkok as a prisoner, where he died. A Siamese military campaign in Laos in 1876 was described by a British observer as having been "transformed into slave-hunting raids on a large scale". In the late 19th century, Luang Prabang was ransacked by the Chinese Black Flag Army. France rescued King Oun Kham and added Luang Phrabang to the Protectorate of French Indochina. Shortly after, the Kingdom of Champasak and the territory of Vientiane were added to the protectorate. King Sisavang Vong of Luang Phrabang became ruler of a unified Laos and Vientiane once again became the capital. Laos never had any importance for France other than as a buffer state between Thailand and the more economically important Annam and Tonkin. During their rule, the French introduced the corvée, a system that forced every male Lao to contribute 10 days of manual labour per year to the colonial government. Laos produced tin, rubber, and coffee, but never accounted for more than one percent of French Indochina's exports. By 1940, around 600 French citizens lived in Laos. Under the French rule, the Vietnamese were encouraged to migrate to Laos, which was seen by the French colonists as a rational solution to a practical problem within the confines of an Indochina-wide colonial space. By 1943, the Vietnamese population stood at nearly 40,000, forming the majority in the largest cities of Laos and enjoying the right to elect their own leaders. As a result, 53% of the population of Vientiane, 85% of Thakhek and 62% of Pakse were Vietnamese, with only an exception of Luang Phrabang where the population was predominantly Lao. As late as 1945, the French even drew up an ambitious plan to move massive Vietnamese population to three key areas, i.e. the Vientiane Plain, Savannakhet region, Bolaven Plateau, which was only discarded by Japanese invasion of Indochina. Otherwise, according to Martin Stuart-Fox, the Lao might well have lost control over their own country. During World War II in Laos, Vichy France, fascist Thailand, Imperial Japan and Free France occupied Laos. On 9 March 1945, a nationalist group declared Laos once more independent, with Luang Prabang as its capital but on 7 April 1945 two battalions of Japanese troops occupied the city. The Japanese attempted to force Sisavang Vong (the King of Luang Phrabang) to declare Laotian independence but on 8 April he instead simply declared an end to Laos's status as a French protectorate. The King then secretly sent Prince Kindavong to represent Laos to the Allied forces and Prince Sisavang as representative to the Japanese. When Japan surrendered, some Lao nationalists (including Prince Phetsarath) declared Laotian independence, but by early 1946, French troops had reoccupied the country and conferred limited autonomy on Laos. During the First Indochina War, the Indochinese Communist Party formed the Pathet Lao independence organisation. The Pathet Lao began a war against the French Colonial forces with the aid of the Vietnamese independence organisation (the Viet Minh). In 1950 the French were forced to give Laos semi-autonomy as an "associated state" within the French Union. France remained in de facto control until 22 October 1953, when Laos gained full independence as a constitutional monarchy. The First Indochina War took place across French Indochina and eventually led to French defeat and the signing of a peace accord for Laos at the Geneva Conference of 1954. In 1955, the US Department of Defense created a special Programs Evaluation Office to replace French support of the Royal Lao Army against the communist Pathet Lao as part of the US containment policy. In 1960, amidst a series of rebellions in the Kingdom of Laos, fighting broke out between the Royal Lao Army and the communist North Vietnam-backed, and Soviet Union-backed Pathet Lao guerillas. A second Provisional Government of National Unity formed by Prince Souvanna Phouma in 1962 was unsuccessful, and the situation steadily deteriorated into large scale civil war between the Royal Laotian government and the Pathet Lao. The Pathet Lao were backed militarily by the NVA and Vietcong. Laos was a key part of the Vietnam War since parts of Laos were invaded and occupied by North Vietnam for use as a supply route for its war against the South. In response, the United States initiated a bombing campaign against the North Vietnamese positions, supported regular and irregular anticommunist forces in Laos and supported South Vietnamese incursions into Laos. In 1968 the North Vietnamese Army launched a multi-division attack to help the Pathet Lao to fight the Royal Lao Army. The attack resulted in the army largely demobilising, leaving the conflict to irregular ethnic Hmong forces of the "U.S. Secret Army" backed by the United States and Thailand, and led by General Vang Pao. Massive aerial bombardment against the Pathet Lao and invading People's Army of Vietnam forces were carried out by the United States to prevent the collapse of the Royal Kingdom of Laos central government, and to deny the use of the Ho Chi Minh Trail to attack US forces in the Republic of Vietnam. Between 1964 and 1973, the U.S. dropped two million tons of bombs on Laos, nearly equal to the 2.1 million tons of bombs the U.S. dropped on Europe and Asia during all of World War II, making Laos the most heavily bombed country in history relative to the size of its population; The New York Times noted this was "nearly a ton for every person in Laos". Some 80 million bombs failed to explode and remain scattered throughout the country, rendering vast swathes of land impossible to cultivate and killing or maiming 50 Laotians every year. Due to the particularly heavy impact of cluster bombs during this war, Laos was a strong advocate of the Convention on Cluster Munitions to ban the weapons, and was host to the First Meeting of States Parties to the convention in November 2010. In 1975 the Pathet Lao, along with the Vietnam People's Army, and backed by the Soviet Union, overthrew the royalist Lao government, forcing King Savang Vatthana to abdicate on 2 December 1975. He later died in prison. Between 20,000 and 62,000 Laotians died during the Civil War. On 2 December 1975, after taking control of the country, the Pathet Lao government under Kaysone Phomvihane renamed the country as the Lao People's Democratic Republic and signed agreements giving Vietnam the right to station armed forces and to appoint advisers to assist in overseeing the country. In a paper published in 1990, Hmong-rights activist Vang Pobzeb wrote that Laos was colonial territory of Vietnam since 2 December 1975 and was directed by Vietnam in its internal and external affairs. The close ties between Laos and Vietnam were formalized via a treaty signed in 1977, which has since provided not only directions for Lao foreign policy, but also the basis for Vietnamese involvement at all levels of Lao political and economic life. Laos was requested in 1979 by the Socialist Republic of Vietnam to end relations with the People's Republic of China, leading to isolation in trade by China, the United States, and other countries. In 1979 there were 50,000 Vietnamese troops stationed in Laos and as many as 6,000 civilian Vietnamese officials including 1,000 directly attached to the ministries in Vientiane. The conflict between Hmong rebels and the Vietnam People's Army of the Socialist Republic of Vietnam (SRV), as well as the SRV-backed Pathet Lao continued in key areas of Laos, including in Saysaboune Closed Military Zone, Xaisamboune Closed Military Zone near Vientiane Province and Xieng Khouang Province. From 1975 to 1996, the United States resettled some 250,000 Lao refugees from Thailand, including 130,000 Hmong (see: Indochina refugee crisis). On 2 December 2015, Laos celebrated its 40th anniversary of the establishment of the republic. Laos is the only landlocked country in Southeast Asia, and it lies mostly between latitudes 14° and 23°N (a small area is south of 14°), and longitudes 100° and 108°E. Its thickly forested landscape consists mostly of rugged mountains, the highest of which is Phou Bia at 2,818 metres (9,245 ft), with some plains and plateaus. The Mekong River forms a large part of the western boundary with Thailand, where the mountains of the Annamite Range form most of the eastern border with Vietnam and the Luang Prabang Range the northwestern border with the Thai highlands. There are two plateau, the Xiangkhoang in the north and the Bolaven Plateau at the southern end. The climate is tropical and influenced by the monsoon pattern. There is a distinct rainy season from May to November, followed by a dry season from December to April. Local tradition holds that there are three seasons (rainy, cold and hot) as the latter two months of the climatologically defined dry season are noticeably hotter than the earlier four months. The capital and largest city of Laos is Vientiane and other major cities include Luang Prabang, Savannakhet, and Pakse. In 1993 the Laos government set aside 21 percent of the nation's land area for habitat conservation preservation. The country is one of four in the opium poppy growing region known as the "Golden Triangle". According to the October 2007 UNODC fact book Opium Poppy Cultivation in South East Asia, the poppy cultivation area was 15 square kilometres (5.8 sq mi), down from 18 square kilometres (6.9 sq mi) in 2006. Laos can be considered to consist of three geographical areas: north, central, and south. Laos map of Köppen climate classification. Laos has a mostly tropical savanna climate. A tropical monsoon and humid sub-tropical climate also occurs in places. Laos is divided into 17 provinces (khoueng) and one prefecture (kampheng nakhon), which includes the capital city Vientiane (Nakhon Louang Viangchan). The new province, Xaisomboun Province, was established on 13 December 2013. Provinces are further divided into districts (muang) and then villages (ban). An "urban" village is essentially a town. An updated map of the Laos provinces (from 2014). The Lao People's Democratic Republic is one of the world's only socialist states openly endorsing communism. The only legal political party is the Lao People's Revolutionary Party (LPRP). The head of state is President Bounnhang Vorachith, also General Secretary of the Lao People's Revolutionary Party. 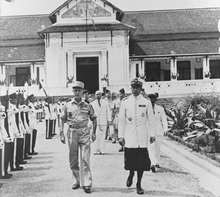 Laos's first, French-written and monarchical constitution was promulgated on 11 May 1947, and declared Laos an independent state within the French Union. The revised constitution of 11 May 1957 omitted reference to the French Union, though close educational, health and technical ties with the former colonial power persisted. The 1957 document was abrogated on 3 December 1975, when a communist People's Republic was proclaimed. A new constitution was adopted in 1991 and enshrined a "leading role" for the LPRP. In 1990, deputy minister for science & technology Thongsouk Saysangkhi resigned from the government and party, calling for political reform. He died in captivity in 1998. In 1992 elections were held for a new 85-seat National Assembly with members, nominated by the one-party communist government, elected by secret ballot to five-year terms. The elections were widely disputed and questioned by Lao and Hmong opposition and dissident groups abroad and in Laos and Thailand. This National Assembly, which essentially acts as a rubber stamp for the LPRP, approves all new laws, although the executive branch retains authority to issue binding decrees. The most recent elections took place in April 2011. The assembly was expanded to 99 members in 1997, to 115 members in 2006 and finally to 132 members during the 2011 elections. On 17 May 2014 the Defense Minister, who was also Deputy Prime Minister, Major General Douangchay Phichit, with other top ranking officials was killed in a plane crash in the north of the country. The officials were to participate in a ceremony to mark the liberation of the Plain of Jars from the former Royal Lao government forces. Their Russian-built Antonov AN 74–300 with 20 people on board crashed in Xiengkhouang province. Some Hmong groups fought as CIA-backed units on the royalist side in the Laotian Civil War. After the Pathet Lao took over the country in 1975, the conflict continued in isolated pockets. In 1977, a communist newspaper promised the party would hunt down the "American collaborators" and their families "to the last root". As many as 200,000 Hmong went into exile in Thailand, with many ending up in the US. A number of Hmong fighters hid out in mountains in Xiangkhouang Province for many years, with a remnant emerging from the jungle in 2003. In 1989, the United Nations High Commissioner for Refugees (UNHCR), with the support of the US government, instituted the Comprehensive Plan of Action, a programme to stem the tide of Indochinese refugees from Laos, Vietnam, and Cambodia. Under the plan, refugee status was evaluated through a screening process. Recognized asylum seekers were given resettlement opportunities, while the remaining refugees were to be repatriated under guarantee of safety. After talks with the UNHCR and the Thai government, Laos agreed to repatriate the 60,000 Lao refugees living in Thailand, including several thousand Hmong people. Very few of the Lao refugees, however, were willing to return voluntarily. Pressure to resettle the refugees grew as the Thai government worked to close its remaining refugee camps. While some Hmong people returned to Laos voluntarily, with development assistance from UNHCR, allegations of forced repatriation surfaced. Of those Hmong who did return to Laos, some quickly escaped back to Thailand, describing discrimination and brutal treatment at the hands of Lao authorities. In 1993, Vue Mai, a former Hmong soldier and leader of the largest Hmong refugee camp in Thailand, who had been recruited by the US Embassy in Bangkok to return to Laos as proof of the repatriation programme's success, disappeared in Vientiane. According to the US Committee for Refugees, he was arrested by Lao security forces and was never seen again. Following the Vue Mai incident, debate over the Hmong's planned repatriation to Laos intensified greatly, especially in the United States, where it drew strong opposition from many American conservatives and some human rights advocates. In a 23 October 1995 National Review article, Michael Johns, the former Heritage Foundation foreign policy expert and Republican White House aide, labelled the Hmong's repatriation a Clinton administration "betrayal", describing the Hmong as a people "who have spilled their blood in defense of American geopolitical interests". Debate on the issue escalated quickly. In an effort to halt the planned repatriation, the Republican-led US Senate and House of Representatives both appropriated funds for the remaining Thailand-based Hmong to be immediately resettled in the United States; Clinton, however, responded by promising a veto of the legislation. In their opposition of the repatriation plans, Democratic and Republican Members of Congress challenged the Clinton administration's position that the government of Laos was not systematically violating Hmong human rights. US Representative Steve Gunderson (R-WI), for instance, told a Hmong gathering: "I do not enjoy standing up and saying to my government that you are not telling the truth, but if that is necessary to defend truth and justice, I will do that." Republicans called several Congressional hearings on alleged persecution of the Hmong in Laos in an apparent attempt to generate further support for their opposition to the Hmong's repatriation to Laos. Democratic Congressman Bruce Vento, Senator Paul Wellstone, Dana Rohrabacher and others also raised concerns. Although some accusations of forced repatriation were denied, thousands of Hmong people refused to return to Laos. In 1996 as the deadline for the closure of Thai refugee camps approached, and under mounting political pressure, the United States agreed to resettle Hmong refugees who passed a new screening process. Around 5,000 Hmong people who were not resettled at the time of the camp closures sought asylum at Wat Tham Krabok, a Buddhist monastery in central Thailand where more than 10,000 Hmong refugees had already been living. The Thai government attempted to repatriate these refugees, but the Wat Tham Krabok Hmong refused to leave and the Lao government refused to accept them, claiming they were involved in the illegal drug trade and were of non-Lao origin. Following threats of forcible removal by the Thai government, the United States, in a significant victory for the Hmong, agreed to accept 15,000 of the refugees in 2003. Several thousand Hmong people, fearing forced repatriation to Laos if they were not accepted for resettlement in the United States, fled the camp to live elsewhere within Thailand where a sizeable Hmong population has been present since the 19th century. In 2004 and 2005, thousands of Hmong fled from the jungles of Laos to a temporary refugee camp in the Thai province of Phetchabun. These Hmong refugees, many of whom are descendants of the former-CIA Secret Army and their relatives, claim that they have been attacked by both the Lao and Vietnamese military forces operating inside Laos as recently as June 2006. The refugees claim that attacks against them have continued almost unabated since the war officially ended in 1975, and have become more intense in recent years. Lending further support to earlier claims that the government of Laos was persecuting the Hmong, filmmaker Rebecca Sommer documented first-hand accounts in her documentary, Hunted Like Animals, and in a comprehensive report that includes summaries of refugee claims and was submitted to the UN in May 2006. The European Union, UNHCHR, and international groups have since spoken out about the forced repatriation. The Thai foreign ministry has said that it will halt deportation of Hmong refugees held in Detention Centres in Nong Khai, while talks are underway to resettle them in Australia, Canada, the Netherlands and the United States. For the time being, countries willing to resettle the refugees are hindered in their immigration and settlement procedures because the Thai administration does not grant them access to the refugees. Plans to resettle additional Hmong refugees in the United States have been complicated by provisions of President George W. Bush's Patriot Act and Real ID Act, under which Hmong veterans of the Secret War, who fought on the side of the United States, are classified as terrorists because of their historical involvement in armed conflict. On 27 December 2009, The New York Times reported that the Thai military was preparing to forcibly return 4,000 Hmong asylum seekers to Laos by the end of the year. The BBC later reported that repatriations had started. Both United States and United Nations officials have protested this action. Outside government representatives have not been allowed to interview this group over the last three years. Médecins Sans Frontières has refused to assist the Hmong refugees because of what they have called "increasingly restrictive measures" taken by the Thai military. The Thai military jammed all cellular phone reception and disallowed any foreign journalists from the Hmong camps. Human rights violations remain a significant concern in Laos. Prominent civil society advocates, human rights defenders, political and religious dissidents, and Hmong refugees have disappeared at the hands of Lao military and security forces. Ostensibly, the Constitution of Laos that was promulgated in 1991, and amended in 2003, contains most key safeguards for human rights. For example, Article 8 makes it clear that Laos is a multinational state and is committed to equality between ethnic groups. The Constitution also contains provisions for gender equality, freedom of religion, freedom of speech, and freedom of press and assembly. On 25 September 2009, Laos ratified the International Covenant on Civil and Political Rights, nine years after signing the treaty. The stated policy objectives of both the Lao government and international donors remain focused upon achieving sustainable economic growth and poverty reduction. However, the government of Laos frequently breaches its own constitution and the rule of law, since the judiciary and judges are appointed by the ruling communist party—an independent judicial branch does not exist. According to independent non-profit/non-governmental organizations (NGOs) such as Amnesty International, Human Rights Watch, and Civil Rights Defenders, along with the U.S. State Department, serious human rights violations such as arbitrary detentions, disappearances, free speech restrictions, prison abuses and other violations are an ongoing problem. Amnesty International raised concerns about the ratification record of the Lao government on human rights standards, and its lack of co-operation with the UN human rights mechanisms and legislative measures—both impact negatively upon human rights. The organisation also raised concerns in relation to freedom of expression, poor prison conditions, restrictions on freedom of religions, protection of refugees and asylum-seekers, and the death penalty. In October 1999, 30 young people were arrested for attempting to display posters calling for peaceful economic, political and social change in Laos. Five of them were arrested and subsequently sentenced to up to 10 years imprisonment on charges of treason. One has since died due to his treatment by prison guards, while one has been released. The surviving three men should have been released by October 2009, but their whereabouts remain unknown. Later reports have contradicted this, claiming they were sentenced to 20 years in prison. In late February 2017, two of those imprisoned were finally released after 17 years. Laos and Vietnamese (SRV) troops were reported to have raped and killed four Christian Hmong women in Xiangkhouang Province in 2011, according to the US-based non-governmental public policy research organisation The Centre for Public Policy Analysis. [clarification needed] CPPA also said other Christian and independent Buddhist and animist believers were being persecuted. The Centre for Public Policy Analysis, Amnesty International, Human Rights Watch, US Commission on International Religious Freedom, the Lao Veterans of America, Inc. and other non-governmental organisations (NGO)s have reported egregious human rights violations, religious persecution, the arrest and imprisonment of political and religious dissidents as well as extrajudicial killings, in Laos by government military and security forces. Human rights advocates including Vang Pobzeb, Kerry and Kay Danes and others have also raised concerns about human rights violations, torture, the arrest and detention of political prisoners as well as the detention of foreign prisoners in Laos including at the infamous Phonthong Prison in Vientiane. Concerns have been raised about the high-profile abduction of Laotian civic activist and Lao PDR's only living Ramon Magsaysay Award laureate Sombath Somphone by Lao security forces and police on 15 December 2012. In The Economist's Democracy Index 2016 Laos was classified as an "authoritarian regime", ranking lowest of the nine ASEAN nations included in the study. The foreign relations of Laos after the takeover by the Pathet Lao in December 1975, were characterized by a hostile posture toward the West, with the government of the Lao People's Democratic Republic aligning itself with the Soviet bloc, maintaining close ties with the Soviet Union and depending heavily on the Soviets for most of its foreign assistance. Laos also maintained a "special relationship" with Vietnam and formalized a 1977 treaty of friendship and cooperation that created tensions with China. With the collapse of the Soviet Union and with Vietnam's decreased ability to provide assistance, Laos has sought to improve relations with its regional neighbours. Laos's emergence from international isolation has been marked through improved and expanded relations with other nations such as Pakistan, Saudi Arabia, China, Turkey, Australia, France, Japan, and Sweden. Trade relations with the United States were normalized in 2004. Laos was admitted into the Association of Southeast Asian Nations (ASEAN) in July 1997 and applied to join the World Trade Organization in 1998. In 2005 it attended the inaugural East Asia Summit. About 80% of the Laotian population practises subsistence agriculture. The Lao economy depends heavily on investment and trade with its neighbours, Thailand, Vietnam, and, especially in the north, China. Pakxe has also experienced growth based on cross-border trade with Thailand and Vietnam. In 2009, despite the fact that the government is still officially communist, the Obama administration in the US declared Laos was no longer a Marxist–Leninist state and lifted bans on Laotian companies receiving financing from the US Export-Import Bank. In 2011, the Lao Securities Exchange began trading. In 2012, the government initiated the creation of the Laos Trade Portal, a website incorporating all information traders need to import and export goods into the country. In 2016, China was the biggest foreign investor in Laos's economy, having invested in US$5.395 billion since 1989, according to Laos Ministry of Planning and Investment 1989–2014 report. Thailand (invested US$4.489 billion) and Vietnam (invested US$3.108 billion) are the second and third largest investors respectively. Subsistence agriculture still accounts for half of the GDP and provides 80 percent of employment. Only 4.01 percent of the country is arable land, and a mere 0.34 percent used as permanent crop land, the lowest percentage in the Greater Mekong Subregion. Rice dominates agriculture, with about 80 percent of the arable land area used for growing rice. 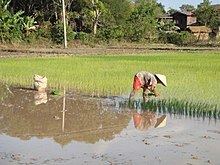 Approximately 77 percent of Lao farm households are self-sufficient in rice. Through the development, release and widespread adoption of improved rice varieties, and through economic reforms, production has increased by an annual rate of five percent between 1990 and 2005, and Lao PDR achieved a net balance of rice imports and exports for the first time in 1999. Lao PDR may have the greatest number of rice varieties in the Greater Mekong Subregion. Since 1995 the Lao government has been working with the International Rice Research Institute of the Philippines to collect seed samples of each of the thousands of rice varieties found in Laos. The economy receives development aid from the IMF, ADB, and other international sources; and also foreign direct investment for development of the society, industry, hydropower and mining (most notably of copper and gold). Tourism is the fastest-growing industry in the country. Economic development in Laos has been hampered by brain drain, with a skilled emigration rate of 37.4 percent in 2000. Laos is rich in mineral resources and imports petroleum and gas. Metallurgy is an important industry, and the government hopes to attract foreign investment to develop the substantial deposits of coal, gold, bauxite, tin, copper, and other valuable metals. In addition, the country's plentiful water resources and mountainous terrain enable it to produce and export large quantities of hydroelectric energy. Of the potential capacity of approximately 18,000 megawatts, around 8,000 megawatts have been committed for exporting to Thailand and Vietnam. The country's most widely recognised product may well be Beerlao, which is exported to many developed countries around the world such as the US, Britain, Germany, Japan, South Korea, and neighbours Cambodia and Vietnam. It is produced by the Lao Brewery Company. The mining industry of Laos has received prominent attention with foreign direct investments. This sector, since 2003–04, has made significant contributions to the economic condition of Laos. More than 540 mineral deposits of gold, copper, zinc, lead and other minerals have been identified, explored and mined. In 2018, the country ranked 139th on the Human Development Index (HDI), indicating medium development. According to the Global Hunger Index (2018), Laos ranks as the 36th hungriest nation in the world out of the list of the 52 nations with the worst hunger situation(s). In 2019, the UN Special Rapporteur on extreme poverty and human rights conducted an official visit to Laos, and found that the country's top-down approach to economic growth and poverty alleviation "is all too often counterproductive, leading to impoverishment and jeopardising the rights of the poor and marginalised." In March 2019 the government of Laos announced an interest in permitting cannabis to be used for medicinal purposes. The Prime Minister's Office issued an announcement entrusting the Ministry of Foreign Affairs in collaboration with the Ministry of Health and other sectors to organise a seminar to discuss and study the medical use of cannabis. Outcomes of the seminar discussion will be reported to the government as a reference for a subsequent decision. The tourism sector has grown rapidly, from 80,000 international visitors in 1990, to 1.876 million in 2010. Tourism is expected to contribute US$679.1 million to the gross national product in 2010, rising to US$1.5857 billion by 2020. In 2010, one in every 10.9 jobs was in the tourism sector. Export earnings from international visitors and tourism goods are expected to generate 15.5 percent of total exports or US$270.3 million in 2010, growing in nominal terms to US$484.2 million (12.5 percent of the total) in 2020. The official tourism slogan is "Simply Beautiful". The main attractions for tourists include Buddhist culture and colonial architecture in Luang Prabang; gastronomy and ancient temples in the capital of Vientiane; backpacking in Muang Ngoi Neua and Vang Vieng; ancient and modern culture and history in the Plain of Jars region (main article: Phonsavan); Laos Civil War history in Sam Neua; trekking and visiting hill tribes in a number of areas including Phongsaly and Luang Namtha; spotting tigers and other wildlife in Nam Et-Phou Louey; caves and waterfalls near Thakhek; relaxation, the Irrawaddy dolphin and Khone Phapheng Falls at Si Phan Don or, as they are known in English, the Four Thousand Islands; Wat Phu, an ancient Khmer temple complex; and the Bolaven Plateau for waterfalls and coffee. The European Council on Trade and Tourism awarded the country the "World Best Tourist Destination" designation for 2013 for this combination of architecture and history. Luang Prabang and Wat Phu are both UNESCO World Heritage sites, with the Plain of Jars expected to join them once more work to clear UXO has been completed. Major festivals include Lao New Year celebrated around 13–15 April and involves a water festival similar but more subdued than that of Thailand and other Southeast Asian countries. The Lao National Tourism Administration, related government agencies and the private sector are working together to realize the vision put forth in the country's National Ecotourism Strategy and Action Plan. This includes decreasing the environmental and cultural impact of tourism; increasing awareness in the importance of ethnic groups and biological diversity; providing a source of income to conserve, sustain and manage the Lao protected area network and cultural heritage sites; and emphasizing the need for tourism zoning and management plans for sites that will be developed as ecotourism destinations. Laos is known for silk and local handicraft products, which are on display in Luang Prabang's night market, among other places. Another specialty is mulberry tea. Rivers are an important means of transport in Laos. The main international airports are Vientiane's Wattay International Airport and Luang Prabang International Airport with Pakse International Airport also having a few international flights. The national carrier is Lao Airlines. Other carriers serving the country include Bangkok Airways, Vietnam Airlines, AirAsia, Thai Airways International, China Eastern Airlines and Silk Air. Much of Laos lacks adequate infrastructure. Laos has no railways, except a short link to connect Vientiane with Thailand over the Thai–Lao Friendship Bridge. A short portage railway, the Don Det—Don Khon narrow gauge railway was built by the French in Champasak Province but has been closed since the 1940s. In the late 1920s, work began on the Thakhek–Tan Ap railway that would have run between Thakhek, Khammouane Province and Tân Ấp Railway Station, Quảng Bình Province, Vietnam through the Mụ Giạ Pass. The scheme was aborted in the 1930s. The major roads connecting the major urban centres, in particular Route 13, have been significantly upgraded in recent years, but villages far from major roads can be reached only through unpaved roads that may not be accessible year-round. There is limited external and internal telecommunication, but mobile phones have become widespread in urban centres. In many rural areas electricity is at least partly available. Songthaews (pick-up trucks with benches) are used in the country for long-distance and local public transport. Laos has made particularly noteworthy progress increasing access to sanitation and has already met its 2015 Millennium Development Goal (MDG) target. Laos's predominantly rural (68 percent, source: Department of Statistics, Ministry of Planning and Investment, 2009) population makes investing in sanitation difficult. In 1990 only eight percent of the rural population had access to improved sanitation. Access rose rapidly from 10 percent in 1995 to 38 percent in 2008. Between 1995 and 2008 approximately 1,232,900 more people had access to improved sanitation in rural areas. Laos's progress is notable in comparison to similar developing countries. This success is in part due to small-scale independent providers emerging in a spontaneous manner or having been promoted by public authorities. The authorities in Laos have recently developed an innovative regulatory framework for Public–Private partnership contracts signed with small enterprises, in parallel with more conventional regulation of State-owned water enterprises. According to the World Bank data conducted in 2014, Laos has met the Millennium Development Goal (MDG) targets on water and sanitation regarding UNICEF/WHO Joint Monitoring Programme. However, as of today, there are approximately 1.9 million Lao population could not access to improved water supply and 2.4 million people without access to improved sanitation due to a large inequalities access between areas that are close to good roads and remote inaccessible locations. The term "Laotian" does not necessarily refer to the Lao language, ethnic Lao people, language or customs. It is a political term that includes the non-ethnic Lao groups within Laos and identifies them as "Laotian" because of their political citizenship. Laos has the youngest population of any country in Asia with a median age of 21.6 years. Laos's population was estimated at 7.23 million in 2018, dispersed unevenly across the country. Most people live in valleys of the Mekong River and its tributaries. Vientiane prefecture, the capital and largest city, had about 740,010 residents in 2008. The country's population density was 27/km2. The people of Laos are often considered by their altitudinal distribution (lowlands, midlands and upper high lands) as this approximates ethnic groups. More than half of the nation's population is ethnic Lao—the principal lowland inhabitants, and the politically and culturally dominant people of Laos. The Lao belong to the Tai linguistic group who began migrating southward from China in the first millennium CE. Ten percent belong to other "lowland" groups, which together with the Lao people make up the Lao Loum. In the central and southern mountains, Mon-Khmer tribes, known as Lao Theung or mid-slope Laotians, predominate. 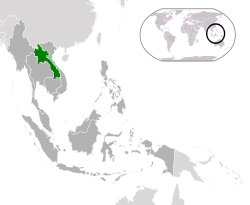 Other terms are Khmu, Khamu (Kammu) or Kha as the Lao Loum refer to them as indicating their Austroasiatic origins. However, the latter is considered pejorative, meaning 'slave'. They were the indigenous inhabitants of northern Laos. Some Vietnamese, Chinese and Thai minorities remain, particularly in the towns, but many left after independence in the late 1940s, many of whom relocated either to Vietnam, Hong Kong, or to France. Lao Theung constitute about 30 percent of the population. Hill people and minority cultures of Laos such as the Hmong, Yao (Mien), Dao, Shan, and several Tibeto-Burman speaking peoples have lived in isolated regions of Laos for many years. Mountain/hill tribes of mixed ethno/cultural-linguistic heritage are found in northern Laos, which include the Lua and Khmu people who are indigenous to Laos. Today, the Lua people are considered endangered. Collectively, they are known as Lao Soung or highland Laotians. Lao Soung account for only about 10 percent of the population. The emergence of rural ATMs proved that law and order has improved. The official and dominant language is Lao, a tonal language of the Tai linguistic group. However, only slightly more than half of the population speaks Lao natively. The remainder, particularly in rural areas, speak ethnic minority languages. The Lao alphabet, which evolved sometime between the 13th and 14th centuries, was derived from the ancient Khmer script and is very similar to Thai, and easily understood by readers of Thai script. Languages like Khmu and Hmong are spoken by minorities, particularly in the midland and highland areas. A number of Laotian sign languages are used in areas with high rates of congenital deafness. French is still commonly used in government and commerce and over a third of Laos's students are educated through the medium of French with French being compulsory for all other students. Throughout the country signage is bilingual in Lao and French, with French being predominant. English, the language of the Association of Southeast Asian Nations (ASEAN), has become increasingly studied in recent years. 64.7 percent of Laotians are Theravada Buddhist, 1.7 percent are Christian, and 31.5 percent are other or traditional (mostly practitioners of Satsana Phi) according to the 2005 census. Buddhism has long been one of the most important social forces in Laos. Theravada Buddhism has coexisted peacefully since its introduction to the country with the local polytheism. Male life expectancy at birth was at 62.6 years and female life expectancy was at 66.7 years in 2017. Healthy life expectancy was 54 years in 2007. In 2008, 43 percent of the population did not have access to sanitary water resources. By 2010 this had been reduced to 33 percent of the population. Government expenditure on health is about four percent of GDP, about US$18 (PPP) in 2006. The adult literacy rate exceeds two thirds. The male literacy rate exceeds the female literacy rate. The total literacy rate is 73 percent (2010 estimate). In 2004 the net primary enrollment rate was at 84 percent. The National University of Laos is the Lao state's public university. As a low-income country, Laos faces a brain-drain problem as the most educated people migrate to developed countries. It is estimated that about 37% of educated Laotians live outside of Laos. Theravada Buddhism is a dominant influence in Lao culture. It is reflected throughout the country from language to the temple and in art, literature, performing arts, etc. Many elements of Lao culture predate Buddhism, however. For example, Laotian music is dominated by its national instrument, the khaen, a type of bamboo pipe that has prehistoric origins. The khaen traditionally accompanied the singer in lam, the dominant style of folk music. Among the lam styles, the lam saravane is probably the most popular. 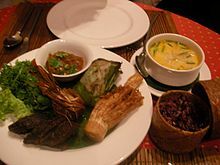 Sticky rice is a characteristic staple food and has cultural and religious significance to the Lao people. Sticky rice is generally preferred over jasmine rice, and sticky rice cultivation and production is thought to have originated in Laos. There are many traditions and rituals associated with rice production in different environments and among many ethnic groups. For example, Khammu farmers in Luang Prabang plant the rice variety Khao Kam in small quantities near the hut in memory of dead parents, or at the edge of the rice field to indicate that parents are still alive. Sinh is a traditional garment worn by Laotian women in daily life. It is a hand-woven silk skirt that can identify the woman who wears it in a variety of ways. In particular, it can indicate which region the wearer is from.. Since the founding of the Lao PDR in 1975 only very few films have been made in Laos. The first feature-length film made after the monarchy was abolished is Gun Voice from the Plain of Jars, directed by Somchith Pholsena in 1983, although its release was prevented by a censorship board. One of the first commercial feature-length films was Sabaidee Luang Prabang, made in 2008. Australian filmmaker Kim Mordount's first feature film was made in Laos and features a Laotian cast speaking their native language. Entitled The Rocket, the film appeared at the 2013 Melbourne International Film Festival (MIFF) and won three awards at the Berlin International Film Festival. Recently a few local production companies have succeeded to produce Lao feature films and gain international recognition. Among them are Lao New Wave Cinema's At the Horizon, directed by Anysay Keola, that was screened at the OzAsia Film Festival and Lao Art Media's Chanthaly (Lao: ຈັນທະລີ) directed by Mattie Do, which was screened at the 2013 Fantastic Fest. In September 2017, Laos submitted Dearest Sister (Lao: ນ້ອງຮັກ), Mattie Do's second feature film, to the 90th Academy Awards (or the Oscars) for consideration for Best Foreign Language Film, marking the country's first submission for the Oscars. As of 2018, Laos has only three operating theatres dedicated to showing films. There are some public holidays, festivities and ceremonies in Laos. All newspapers are published by the government, including two foreign language papers: the English-language daily Vientiane Times and the French-language weekly Le Rénovateur. Additionally, the Khao San Pathet Lao, the country's official news agency, publishes English and French versions of its eponymous paper. Laos currently has nine daily newspapers, 90 magazines, 43 radio stations, and 32 TV stations operating throughout the country. As of 2011[update], Nhân Dân (The People) and the Xinhua News Agency are the only foreign media organisations permitted to open offices in Laos—both opened bureaus in Vientiane in 2011. The Lao government heavily controls all media channels to prevent critique of its actions. Lao citizens who have criticised the government have been subjected to enforced disappearances, arbitrary arrests and torture. Internet cafes are now common in the major urban centres and are especially popular with the younger generation. Polygamy is officially a crime in Laos, though the penalty is minor. The constitution and Family Code bar the legal recognition of polygamous marriages, stipulating that monogamy is the principal form of marriage in the country. 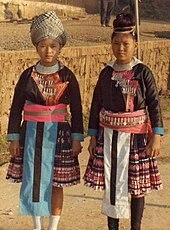 Polygamy, however, is still customary among some Hmong people. The martial art of Muay Lao, the national sport, is a form of kickboxing similar to Thailand's Muay Thai, Burmese Lethwei and Cambodian Pradal Serey. Football has become the most popular sport in Laos. The Lao League is now the top professional league for association football clubs in the country. Since the start of the League, Lao Army FC has been the most successful club with 8 titles (following the 2007–2008 season), the highest number of championship wins. The Laos national basketball team competed at the 2017 Southeast Asian Games where it beat Myanmar at the 8th place match. ^ "The Languages spoken in Laos". Studycountry. Retrieved 16 September 2018. ^ a b c d Laos. CIA – The World Factbook. Cia.gov. Retrieved on 28 July 2018. ^ a b c d "World Economic Outlook Database, April 2018, Laos". International Monetary Fund. April 2018. Retrieved 28 April 2018. ^ "Laos" – via The Free Dictionary. ^ "ABOUT LAOS: GEOGRAPHY". Asia Pacific Parliamentary Forum. Government of Laos. Archived from the original on 16 April 2016. ^ a b Stuart-Fox, Martin (1998). The Lao Kingdom of Lan Xang: Rise and Decline. White Lotus Press. p. 49. ISBN 974-8434-33-8. ^ "GDP per capita, PPP (current international $) | Data". data.worldbank.org. Retrieved 19 January 2019. ^ "Briefing note for countries on the 2015 Human Development Report—Laos" (PDF). HDRO (Human Development Report Office) United Nations Development Programme. Retrieved 26 December 2015. ^ "Lao People's Democratic Republic and the WTO". World Trade Organization. Retrieved 9 August 2014. ^ Janssen, Peter. "China train project runs roughshod over Laos". www.atimes.com. Retrieved 19 January 2019. ^ "Laos approves Xayaburi 'mega' dam on Mekong". BBC News. 5 November 2012. ^ "Lao PDR [Overview]". World Bank. March 2018. Retrieved 25 July 2018. ^ "Laos Securities Exchange to start trading". Ft.com. 10 January 2011. Retrieved 23 January 2011. ^ Kislenko, Arne (2009). Culture and customs of Laos. ABC-CLIO. p. 20. ISBN 978-0-313-33977-6. ^ Demeter, F; Shackelford, L. L.; Bacon, A. M.; Duringer, P; Westaway, K; Sayavongkhamdy, T; Braga, J; Sichanthongtip, P; Khamdalavong, P; Ponche, J. L.; Wang, H; Lundstrom, C; Patole-Edoumba, E; Karpoff, A. M. (2012). "Anatomically modern human in Southeast Asia (Laos) by 46 ka". Proceedings of the National Academy of Sciences. 109 (36): 14375–80. doi:10.1073/pnas.1208104109. PMC 3437904. PMID 22908291. ^ White, J.C.; Lewis, H.; Bouasisengpaseuth, B.; Marwick, B.; Arrell, K (2009). "Archaeological investigations in northern Laos: New contributions to Southeast Asian prehistory". Antiquity. 83 (319). ^ Marwick, Ben; Bouasisengpaseuth, Bounheung (2017). "History and Practice of Archaeology in Laos". In Habu, Junko; Lape, Peter; Olsen, John (eds.). Handbook of East and Southeast Asian Archaeology. Springer. ^ Pittayaporn, Pittayawat (2014). Layers of Chinese Loanwords in Proto-Southwestern Tai as Evidence for the Dating of the Spread of Southwestern Tai Archived 27 June 2015 at the Wayback Machine. MANUSYA: Journal of Humanities, Special Issue No 20: 47–64. ^ "Fa Ngum". History.com. Archived from the original on 8 March 2010. Retrieved 23 January 2011. ^ "Let's hope Laos hangs on to its identity". Asianewsnet.net. Archived from the original on 26 November 2010. Retrieved 23 January 2011. ^ Librios Semantic Environment (11 August 2006). "Laos: Laos under the French". Culturalprofiles.net. Archived from the original on 18 July 2007. Retrieved 23 January 2011. ^ Cummings, Joe and Burke (2005). Laos. Lonely Planet, Andrew. pp. 23–. ISBN 978-1-74104-086-9. ^ "History of Laos". Lonelyplanet.com. 9 August 1960. Retrieved 23 January 2011. ^ Ivarsson, Søren (2008). Creating Laos: The Making of a Lao Space Between Indochina and Siam, 1860–1945. NIAS Press, p. 102. ISBN 978-8-776-94023-2. ^ a b c d Stuart-Fox, Martin (1997). A History of Laos. Cambridge University Press, p. 51. ISBN 978-0-521-59746-3. ^ Kiernan, Ben; Owen, Taylor (26 April 2015). "Making More Enemies than We Kill? Calculating U.S. Bomb Tonnages Dropped on Laos and Cambodia, and Weighing Their Implications". The Asia-Pacific Journal. Retrieved 18 September 2016. ^ Wright, Rebecca (6 September 2016). "'My friends were afraid of me': What 80 million unexploded US bombs did to Laos". CNN. Retrieved 18 September 2016. ^ "Disarmament". The United Nations Office at Geneva. United Nations. November 2011. Retrieved 20 September 2013. ^ Obermeyer, Ziad; Murray, Christopher J. L.; Gakidou, Emmanuela (2008). "Fifty years of violent war deaths from Vietnam to Bosnia: analysis of data from the world health survey programme". BMJ. 336 (7659): 1482–6. doi:10.1136/bmj.a137. PMC 2440905. PMID 18566045. See Table 3. ^ a b Vang, Pobzeb (1990). "White Paper on Vietnamese Aggressions in Laos: 1954-1990" (PDF). Digital Repository, Arizona State University. pp. 24–25. Retrieved 18 April 2018. ^ Stuart-Fox, Martin (1980). 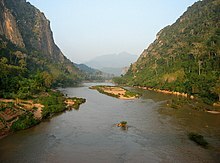 LAOS: The Vietnamese Connection. In Suryadinata, L (Ed. ), Southeast Asian Affairs 1980. Singapore: Institute of Southeast Asian Stuides, p. 191. ^ Prayaga, M. (2005). Renovation in vietnam since 1988 a study in political, economic and social change (PhD thesis). Sri Venkateswara University. Chapter IV: The Metamorphosed Foreign Relations, p. 154. ^ Laos (04/09). U.S. Department of State. ^ Xia, Hua (3 December 2015). "Feature: Laos celebrates National Day, commemorates 40th year of Republic's establishment". Xinhua. Retrieved 16 September 2018. ^ "Laos – Climate". Countrystudies.us. Retrieved 23 January 2011. ^ "Laos travel guides". Indochinatrek.com. Archived from the original on 10 November 2010. Retrieved 23 January 2011. ^ "Mekong Divides Different Worlds In 'Golden Triangle'". NPR.org. Retrieved 1 February 2019. ^ a b "Nsc Lao Pdr". Nsc.gov.la. Archived from the original on 23 January 2012. ^ Amnesty International (29 April 1998). "Thongsouk Saysangkhi's death". ^ Williams, Martin. "Laos plane crash kills defence minister and senior officials". the Guardian. Retrieved 27 February 2019. ^ "Lao Defense Chief Among Plane Crash Victims". Laos News.Net. 18 May 2014. Archived from the original on 18 May 2014. Retrieved 17 May 2014. ^ a b "No way out". The Times. London. 30 July 2006. ^ "Laos agrees to voluntary repatriation of refugees in Thailand", U.P.I., 5 June 1991. ^ "Lao Refugees Return Home Under European Union Repatriation Program", Associated Press Worldstream, 22 11, 1994. Karen J, "House Panel Hears Concerns About Hmong", States News Service, 26 April 1994. ^ Hamilton-Merritt, Jane (1993). Tragic Mountains, Indiana University Press, pp. xix–xxi ISBN 0253207568. ^ "Hmong Leader's Vanishing In Laos Reverberates in U.S." Retrieved 6 September 2016. ^ a b Johns, Michael (23 October 1995) "Acts of Betrayal: Persecution of Hmong". National Review. ^ Gunderson, Steve (18 May 1996) "State Department Outlines Resettlement Guidelines for Hmong Refugees", Congressional Press Releases. ^ "Laos refuses to take back Thai-based Hmong refugees", Deutsche Presse-Agentur, 20 August 1998. ^ "History of the Hmong Resettlement Task Force". Hmong Resettlement Task Force. 7 March 2012. Archived from the original on October 2008. ^ "Hmong refugees pleading to stay". BBC News. 28 July 2005. Retrieved 4 May 2010. ^ "Hmong refugees facing removal from Thailand". The Wire. March 2007. Archived from the original on 13 October 2007. ^ "Thailand halts Hmong repatriation". BBC News. 30 January 2007. Retrieved 4 May 2010. ^ Mydans, Seth (28 December 2009). "Thailand Begins Repatriation of Hmong to Laos". The New York Times. The New York Times Company. Retrieved 4 May 2010. ^ a b "Thailand starts deporting Hmong refugees back to Laos". BBC News. 28 December 2009. Retrieved 28 December 2009. ^ "Lao PDR". World Bank. 14 July 2011. Retrieved 24 July 2011. ^ "Constitution of the Lao PDR" (PDF). Retrieved 24 July 2011. ^ a b c Amnesty International (May 2010). "Submission to the UN Universal Periodic Review: Eighth session of the UPR Working Group of the Human Rights Council". ^ "Human Rights Watch Concerns on Laos Submitted in advance of the EU-Laos Human Rights Dialogue October 2015" (PDF). Human Rights Watch. 2015. Retrieved 9 July 2017. ^ "Human Rights Abuses in Laos Must be Tackled Now". Civil Rights Defenders. 31 August 2016. Archived from the original on 5 October 2017. Retrieved 9 July 2017. ^ United States Bureau of Democracy, Human Rights and Labor. "Country Reports on Human Rights Practices for 2016". U.S. Department of State. ^ Worldwide Movement for Human Rights (October 2016). "Free former student leaders arbitrarily detained for 17 years". ^ rsbtws (February 2017). "AMNESTY INTERNATIONAL REPORT 2016/17: LAOS". ^ The Telegraph (16 April 2011). "Laos, Vietnam troops kill Hmong Christians". ^ AFP (15 April 2011). "Laos, Vietnam troops kill four Hmong Christians: NGO". Archived from the original on 19 April 2011. ^ Cigaral, Ian Nicolas (11 November 2017). "In charts: How the Philippines fares in Southeast Asia". The Philippine Star (Philstar). Retrieved 12 November 2017. ^ "Democracy Index 2016". The Economist Intelligence Unit. The Economist Group. 2017. Retrieved 12 November 2017. ^ THOMAS FULLER (17 September 2009). "Communism and Capitalism Are Mixing in Laos". The New York Times. The New York Times Company. ^ Lowe, Sandra (10 December 2016). "Out of obscurity". www.atimes.com. Retrieved 14 December 2016. ^ Field Listing – Land use, CIA World Factbook. ^ Barclay, Adam and Shrestha, Samjhana (April–June 2006) "Genuinely Lao", Rice Today. ^ "Fifteen years of support for rice research in Lao PDR"
^ "The Green Revolution comes to Laos". Eurekalert.org. 15 March 2006. Retrieved 27 June 2010. ^ "A Race Against Time" (PDF). Archived from the original (PDF) on 14 June 2007. Retrieved 27 June 2010. ^ Özden, Çaḡlar; Schiff, Maurice W. (2006). International migration, remittances, and the brain drain. World Bank Publications. ISBN 978-0-8213-6372-0. ^ "Preparing the Cumulative Impact Assessment for the Nam Ngum 3 Hydropower Project: Financed by the Japan Special Fund" (PDF). Archived from the original (PDF) on 15 May 2011. Retrieved 27 June 2010. ^ Kyophilvong, Phouphet. "Mining Sector in Laos" (PDF). Institute of Developing Economies. p. 69. Archived from the original (pdf) on 6 January 2013. Retrieved 29 November 2015. ^ "Laos weighs medical use of marijuana". Xinhua. Retrieved 10 April 2019. ^ "International visitor data". World Travel & Tourism Council. Retrieved 20 January 2011. ^ "Laos – Key Facts". World Travel & Tourism Council. Retrieved 20 January 2011. ^ European Council On Tourism And Trade Delegation Visit To Laos-World Best Tourist Destination – European Council On Tourism And Trade. Ectt.webs.com. Retrieved on 5 July 2015. ^ "The Lao People's Democratic Republic's Vision for Ecotourism". Archived from the original on 22 November 2010. Retrieved 20 January 2014. ^ Laponche, Bernard; et al. (2008). "Focales n° 8. Energy Efficiency Retrofitting of Buildings – Challenges and Methods" (PDF). afd.fr. Retrieved 17 February 2011. ^ "Water Supply and Sanitation in Lao PDR" (PDF). www.worldbank.org. Retrieved 10 December 2018. ^ "Laos". Central Intelligance Agency: The World Factobook. 17 February 2019. Retrieved 23 February 2019. ^ "Background notes – Laos". US Department of State. Retrieved 20 January 2012. ^ Diller, Anthony; Edmondson, Jerry; Luo, Yongxian (2004). The Tai-Kadai Languages. Routledge (2004), pp. 5-6. ISBN 1135791163. ^ Pittayaporn, Pittayawat (2014). Layers of Chinese Loanwords in Proto-Southwestern Tai as Evidence for the Dating of the Spread of Southwestern Tai. MANUSYA: Journal of Humanities, Special Issue No 20: 47–64. ^ "Khmu people of Laos. OMF International". Omf.org. Archived from the original on 9 November 2007. Retrieved 23 January 2011. ^ "Laos – Ethnic groups and languages". Encyclopædia Britannica. Retrieved 23 January 2011. ^ Benedict, Paul K. (1947). "Languages and Literatures of Indochina". The Far Eastern Quarterly. 6 (4): 379. doi:10.2307/2049433. JSTOR 2049433. ^ "Languages of Laos". Laval University. Retrieved 9 July 2012. ^ Pew Research Center's Global Religious Landscape 2010 – Religious Composition by Country. ^ a b c d e "Human Development Report 2009. Lao People's Democratic Republic". HDRstats.undp.org. Archived from the original on 7 July 2010. Retrieved 27 June 2010. ^ "Human Development Report 2009 – Lao People's Democratic Republic". Hdrstats.undp.org. Archived from the original on 7 July 2010. ^ Fielding, Tony (2015). Asian Migrations: Social and Geographical Mobilities in Southeast, East, and Northeast Asia. Routledge, p. 77. ISBN 978-1-317-95208-4. ^ "Evaluation Synthesis of Rice in Lao PDR" (PDF). Archived from the original (PDF) on 2 July 2007. Retrieved 27 June 2010. ^ Southiponh, Som Ock; Gerow, Aaron (1999). "Starting an Asian Cinema: Laos Past and Present". Documentary Box. Yamagata International Documentary Film Festival. 12: 27. Retrieved 1 January 2019. ^ Buncomb, Andrew (10 June 2010). "Good Good Morning, Luang Prabang – and hello to Laos's film industry". The Independent. Retrieved 22 May 2014. ^ "Q&A with director Kim Mordaunt (The Rocket)". Melbourne International Film Festival. MIFF. August 2013. Archived from the original on 5 October 2013. ^ Catt, Georgia (22 August 2012). "A tale of revenge in Laos challenges censors". BBC. Retrieved 22 May 2014. ^ "Chanthaly". Fantastic Fest. 2013. Retrieved 15 May 2014. ^ Marsh, James (26 September 2013). "Fantastic Fest 2013 Review: Chanthaly is A Haunting Portrait of Modern Day Laos". Twitch. Archived from the original on 16 June 2014. ^ Frater, Patrick (19 September 2017). "Laos Selects 'Dearest Sister' as First Foreign-Language Oscar Submission". Variety. Retrieved 26 October 2017. ^ Brzeski, Patrick (9 May 2018). "Cannes: Southeast Asia Is Ready for Its Big-Screen Close-up". The Hollywood Reporter. Valence Media. Retrieved 1 January 2019. ^ "Laos'un Festivalleri". Gezimanya (in Turkish). 11 November 2016. Retrieved 6 March 2018. ^ "Laos Festivals & Events". visit-laos.com. Retrieved 6 March 2018. ^ "2012 Human Rights Reports: Laos". State.gov. Retrieved 9 August 2014. ^ "Off the air in Laos". Asia Times Online. Retrieved 9 August 2014. ^ "Lao PDR: Family Code". Genderindex.org. Archived from the original on 9 March 2011. ^ Graceffo. "Muay Lao, the forgotten art of kickboxing". GoAbroad Network. Archived from the original on 15 April 2018. ^ "Laos – List of Champions". RSSSF. Retrieved 7 July 2016. ^ FIBA LiveStats, FIBA.com, accessed 24 August 2017. "Laos". The World Factbook. Central Intelligence Agency.